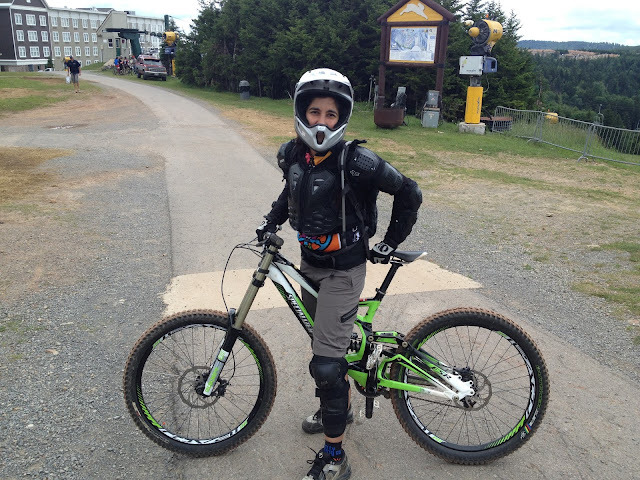 I went to Snowshoe this past weekend for my first downhill Mtn biking camp hosted by Kona's Angie Weston and Allride's Lindsey Voreis. I was excited and a little nervous going into it because it meant I would get my bike off the ground and catch some air (both what I wanted and what I was scared of). 19 women had registered for the camp and we got a last minute entry that Saturday morning. I didn't realize it until after the camp was over but the last entry was Sue Haywood! She is a XC badass. And i got to chat with her a little bit about trails in West Virginia where she lives but had no idea I was speaking to a legend. I wish I could go back and talk to her again, she was down to earth snd super friendly. So we started off the camp with a 30 minute yoga session which actually felt good and warmed me up. Then we went over with our bikes to the skills section that had different wooden structures to practice on. We worked on the rear wheel lift and front wheel lift. I can't wait to try the rear wheel lift on my own bike now. We practiced the lunge which meant pushing your handlebars away from you to launch off on a drop off. I need to work on my timing for this. We got on the trail doing a Green section which is beginner level and that was fun and doable. It also felt faster than I expected. We did a Blue trail (Lucid and Raging Bull) which had one wooden ramp/drop off. I went down the ramp easily but wish I could have launched myself off it to catch some air. 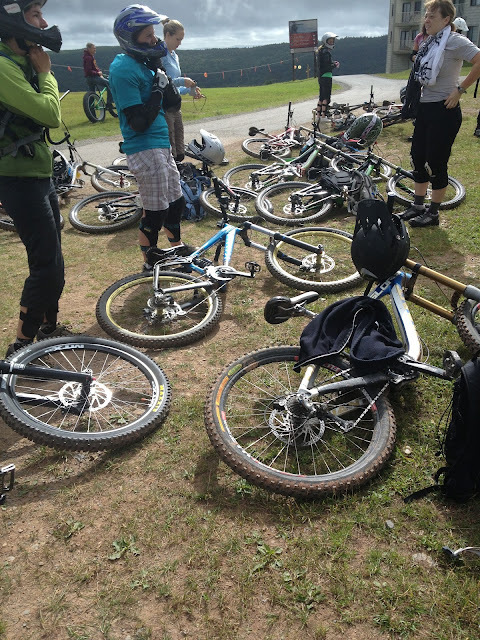 It was all very tiring, I was constantly putting pressure on my pedals and my quads burned. Downhilling takes a lot of energy! We split up into 2 groups and i was in the group being coached by Lindsey Voreis. The next morning we did yoga again and then we worked on cornering and using our suspension to get over logs. I think I rode 1 mile just practicing cornering in the 1/32 mile grassy area we were in. And then we went back on the trail and practiced cornering with Lindsey critiquing us. It was an eye opener to see how much better cornering is when you move your whole body into the corner. 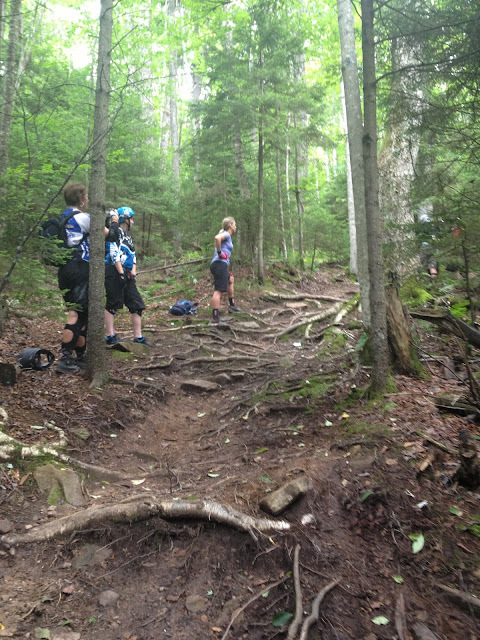 And the the best part- we got onto a Black diamond trail and went over a big rock garden and then several nice downhill rooty sections. I got overly nervous at first and had to give it a second shot but I cleaned the sections and felt pretty good about how I rode it. Lindsey, Katy and the other Lindsay all spotted us and made sure we could do it. At this point I was exhausted and called it a day even though they were going to continue to ride after lunch (1:30 pm). I had an incredible time and incredible coaches. It was a great experience and I definitely want to do it again, I just wish Snowshoe wasn't 6 hours away from where I live! I aim to practice the rear wheel lift, drop offs and cornering at home so I'll be ready the next time for more downhill goodness.